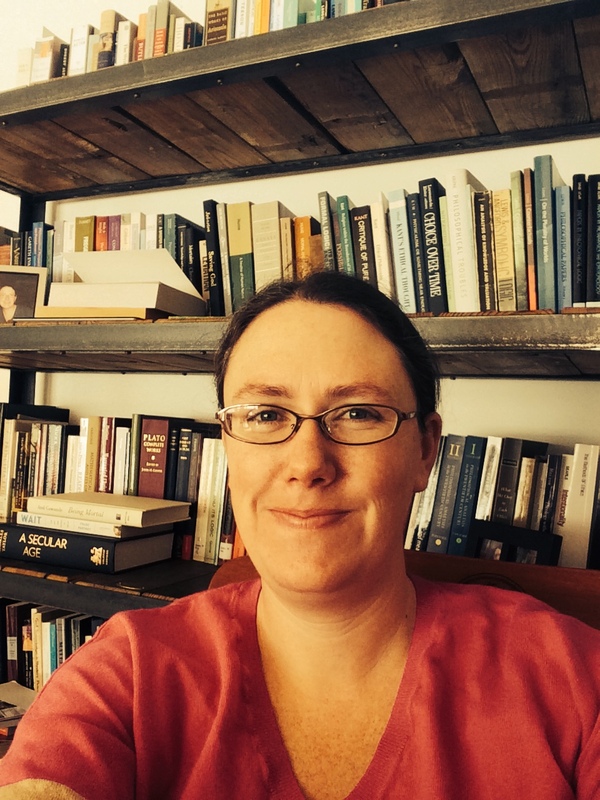 Meghan Sullivan is the Rev John A O’Brien Assistant Professor of Philosophy at the University of Notre Dame. She specializes in metaphysics and topics where it overlaps with semantics, logic, epistemology and practical reason. She’s currently on leave writing a series of papers on issues at the intersection of the metaphysics of time and diachronic rationality, supported by grants from the University of Sydney and UC Riverside. Meghan holds a PhD from Rutgers University and a B.Phil from Oxford, where she studied as a Rhodes Scholar. Stop Procrastinating and Write the Entry! I have to admit, reading the previous Philosop-her entries, I was both deeply impressed with the projects that my colleagues are pursuing and utterly stymied about how to go about writing my own contribution. Even though I knew the deadline was fast approaching, I kept putting off the difficult task of composing the piece. I went on Facebook. I unloaded the dishwasher. I even cleaned out my gutters. One admittedly simplistic explanation for my procrastination is that I prefer experiences that I think will be unpleasant to occur later rather than sooner. I thought writing the piece would be more onerous than cleaning the gutters, so I scheduled gutters first. I’m near biased about my experiences: I discount potential experiences as they are scheduled further in the future. Some people I meet think they are far biased: unlike procrastinators, they prefer to wait for good things and prefer to get unpleasant experiences over with. (My correspondents often think this is a virtue.) Here’s a test to see if you might be far biased. Suppose I promise to give you a wonderful gift—maybe I will buy you a new smartphone or take you on a great trip. You can either have the gift this month or five years from now. If you pay some small sum now—say, $5—I’ll delay the gift. Would you pay? If not, you probably are not far biased. I know I wouldn’t pay to delay a good experience. Indeed, I’d happily pay small sum to schedule it earlier. When people think they are far-biased, I think they are instead describing a psychological fact: presently anticipating some kinds of future experiences gives them present pleasure or anguish. I very well might pay something to experience present anticipatory pleasure, but this isn’t the same as being far biased. What should I make of my near bias? Is it rational? Should I make an effort to try to overcome my procrastinatory ways? Well, one optimistic way of thinking about near bias is it is an extraordinarily useful heuristic for responding to differences in probabilities. We might reasonably suppose that the further some experience is in the future, the less likely it is to occur. And it is perfectly rational to discount potential good or bad experiences based on the subjective probability we assign to the experiences occurring. This probabilistic explanation might go some of the way toward justifying my near bias, but honestly, I still have the bias even once I’ve taken the probabilities into account. After all, I was very confident I would eventually need to write this blog entry. I’m very confident that my dental pain will only increase if I delay getting a filling. I’m very confident that I will survive to age sixty five and be upset if I have meager retirement savings. But I still procrastinate, delay appointments and underfund my Roth IRA. I’d have to have very strange subjective probabilities to explain the robustness of my near bias. All-or-Nothing: There is always a determinate fact of the matter about whether a person at one time is identical to a person at another time, and this fact is what matters to rational planning. For example, there is a fact of the matter about whether I survive to my sixty-fifth birthday, and what matters to my retirement planning is whether someone then will be identical to me. If you take the Gradations view, then you might think that as you project into the more distant future, the person who will benefit from your choices is less and less a person you are related to in whichever way matters for rational planning. So suppose I have $100 that I could either spend on a nice dinner tomorrow or add to my Roth IRA, where it would accrue enough interest to buy a jet ski thirty-four years from now. Meghan-tomorrow is much more worthy of my rational concern then Jetski-Granny-Meghan-in-2048. So it makes sense that I favor nearby person stages. The typical philosophical case against near makes two claims: (1) near biased preferences are arbitrary (they aren’t based on distinctions rational agents ought to attend to), and (2) near bias leads to overall deductions in an agent’s well-being. I think the case is pretty good, and it certainly motivates me to try harder to recognize and overcome my near biases. Should I Care about the Past? Now here’s a curious thing about time and rational preferences—while many philosophers think it is irrational to discount the distant future compared with the near, almost everyone seems to assume that it is rationally permissible (or even obligatory) to discount the past. What do I mean? Consider a case Derek Parfit proposes. You are in the hospital and you have amnesia. The doctor tells you that there is treatment for your condition, but it involves conscious, painful surgery. You either had the surgery yesterday or are scheduled to have it tomorrow—she’s going to check. If you had it yesterday, it was the longest ever recorded in the hospital, ten hours. But if you have it tomorrow, they anticipate it’ll only be two hours. Which situation do you prefer to be in? Loads of (forgotten) pain yesterday? Or less (will be forgotten) pain tomorrow? If you prefer to have had the surgery yesterday, it’s a good sign you are future biased; you discount experiences because they occurred in the past rather than the present or future. Future bias should presumably be held to the same standard as near bias. It wouldn’t be rational to discount past experiences if doing so is arbitrary and leads to overall deductions in well-being. Is future-bias subject to these same criticisms? Whether there are non-arbitrary differences between the past and the future is partly a question for metaphysics. I think there are fundamental differences between the past and future, and one important theme in my research concerns how to understand those metaphysical differences. (See Sullivan 2012 and Sullivan Unpublished). But I’m less certain that any of these metaphysical differences are the kinds of differences that rational agents ought to care about. In fact, at the moment I am writing a paper with an ND PhD student (Peter Finocchiaro) where we examine this very issue. Could being future biased lead to deductions in overall well-being? One way it might is by influencing our views about death. Suppose you have had a happy and fulfilling life, but you are nearing the end. If you are future biased, you might feel dread and loss at the prospect of missing out on potential future happy experiences and might take little solace in acknowledging all of the happy experiences in your past. But perhaps your attitude toward approaching non-existence would be better if you could overcome your future bias and better value those past experiences. Existential crises aside, being future biased also interferes with some important ways you might engage in rational planning. In a forthcoming article in Ethics, Preston Greene and I offer some cases. The details are important and too thorny to get into here, but basically we think it is rationally permissible for agents to make decisions now based on what they anticipate their preferences will be in the future, and to prefer to make decisions that will satisfy all of their future preferences rather than just some of them. But such planning doesn’t work out well for future biased agents, because future biased agents know that at some point their preferences will change. So suppose you are offered the choice between 100 cookies immediately and 10 cookies in an hour. Suppose you are strongly future biased; you know that once the present moment passes, you won’t care about those 100 cookies anymore—you’ll prefer fewer future cookies to more past cookies. Suppose also that you aren’t near-biased (you’ve overcome that rational defect). And suppose you want to make sure your future preferences are satisfied. It seems like your near bias and rational planning will compel you to opt for fewer cookies later. But that’s absurd. Or so Greene and I argue in this paper. Because we think the rational planning principles are reasonable, we think future-bias is where the real trouble lies. We also give a theory or error for why discounting the past seems so intuitive, even if it isn’t rational. There are other fascinating issues at the intersection of the metaphysics of time and practical reason. In closing, I’ll just mention just three others that I’ve been thinking quite a bit about. When we are comparing options about our future, how should we compare scenarios where we do not exist to scenarios where we do? And what rational principles should you appeal to in deciding whether to prolong your natural life? Or deciding whether you hope to have an afterlife? Maybe I’ll tackle those in another blog entry. Oh and I was wrong, by the way. Working on this piece turned out to be an incredibly fun and philosophically rewarding experience. I look forward to reading the upcoming ones in the series. Parfit, Derek. Reasons and Persons. Oxford: Oxford University Press. 1984. Scheffler, Samuel. Death and the Afterlife. Oxford: Oxford University Press 2013. Sullivan, Meghan. The Minimal A-Theory. Philosophical Studies . Vol. 158, Issue 2 (2012), pp. 149-174. —-. Change We Can Believe In (and Assert). Nous , Vol. 48, Issue 3 (Sept 2014), pp. 474-495.